In puppy class and Gaining Control class we teach a chin rest as a behavior that is counter to playful biting. It is an appropriate way for dogs to interact with human hands and serves as an appropriate way for dogs to ask for attention. In addition, there is a sweetness quality that I suspect increases Oxytocin levels which increases bonding. Something about it gives us that Awww effect. But sneaky us, it is also a great husbandry skill. 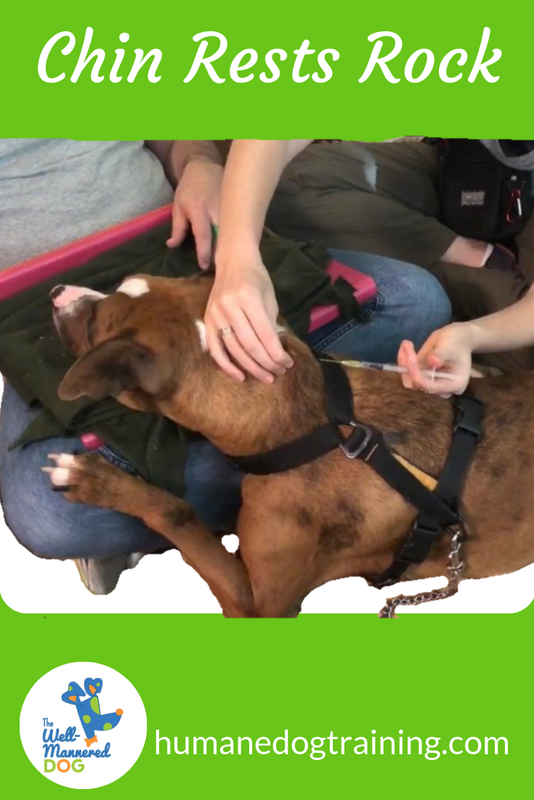 For exams and care in which we want the dog’s head to be still it serves as a “stay for the dog’s head” and this is a major component of our Fear Free Cooperative Care Class. In addition and as a separate training exercise, relaxation with tools needs to taught. Then the chin rest and tools can be teamed up together for really beautiful and relaxing care. Trainers are just touching the surface of the benefits of teaching a nice solid chin rest. With my own puppy, I use it to eliminate floppy puppy sits and have started applying it to jumping on people. Although this one behavior is just now starting to be used in very practical and useful ways for training pet dogs it is proving to be one of the most valuable tools we can teach. Through the past 30 years of working with dogs and their owners I find once training is implemented the bond between the dog and owner is greatly enhanced and both the dog and the owner have a better quality of life. At the Well-Mannered Dog, we practice Humane, Free Free, Positive training.